As parents, we carry a lot of weight and responsibility on our shoulders regarding how our kids will turn out. And the fact that we live our current digital age can make this feel even more difficult. So as a digital parent, where should we start? How can we be confident in the intentional parenting of our digital kids? What does it look like to practice digital parenting successfully? 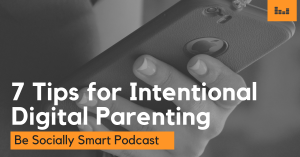 In today’s podcast episode, Caleb shares 7 practical tips for intentional digital parenting that you can implement in your own home. We hope you find some of these tips helpful and applicable to bring an additional level of peace and trust among your family.